Anything with blueberries invariably reminds me of our summer vacation camping in Maine, one of my favorite of all our trips. Since 99% of wild blueberries in the country are grown in Maine, it makes sense, and we had all sorts of delicious blueberry treats while we were there, from blueberry beers to blueberry pancakes. 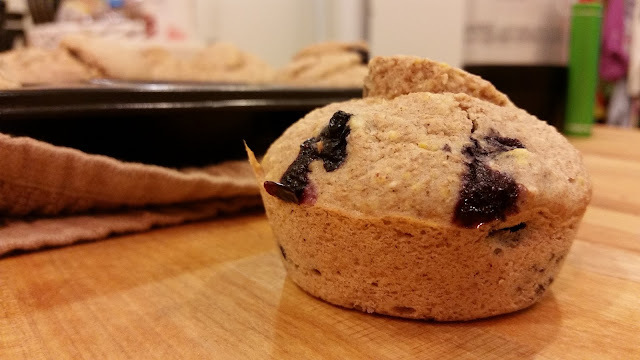 So, imagine my joy when I realized that we happened to have everything we needed to make blueberry muffins without even a single trip to the store, as if we were real adults who keep baking supplies on hand. Maybe you have everything you need, too? If so, I'd highly recommend making these right away. They're quick as a snap to whip up and delicious for breakfast or as an anytime treat. Heat the oven to 375°F and grease a 12-cup muffin tin. Mix together the dry ingredients in a bowl. Beat together the egg, milk, and melted butter or oil in another bowl. (I know it sounds arduous to have to use two bowls, but since I was already adulting, I tried it and it actually worked out quite nicely.) Make a well in the center of the dry ingredients and pour the wet ingredients into it. Using a large spoon or rubber spatula, combine the ingredients quickly, stirring and folding rather than beating and stopping as soon as all the dry ingredients are moistened. The batter should be lumpy, not smooth, and thick but quite moist; add a little more milk if necessary. Spoon the batter into the muffin tins, filling them about two-thirds full and handling the batter as little as possible. Bake for about 20 minutes or until nicely browned and a toothpick inserted in the center of a muffin comes out clean. Remove from the oven and let rest for 5 minutes before taking them out of the tin. Serve warm, and store any leftovers in the refrigerator. Awesome! I too have the ingredients to hand and they're in the oven baking right now! !